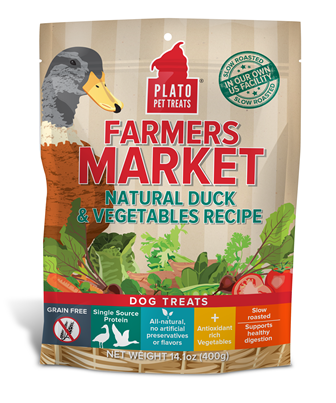 Plato Farmers Market Real Strips Duck & Vegetables recipe are grain-free with NO added sugars, artificial preservatives, by-products, artificial colors, protein-meals, soy, wheat, corn, fillers, and freeze-drying. These single-source novel protein treats are slow roasted in our very own US Facility- especially good for dogs with skin issues, allergies, and food sensitivities. Real Strips duck, chicken, and salmon with fresh veggies from local farms, aid in digestion, skin & coat, and circulation. Available in 400g and 4oz size bags. Duck, sweet potato, carrots, peas, tomato, parsely, salt, citric acid, distilled white vinegar, mixed tocopherols (a preservative), vitamin E supplement L-ascorbyl-2-monophosphate (source of Vitamin C), rosemary extract. Vitamin E 100 IU/kg min. Ascorbic Acid (vitamin c)* 50 mg/kg min.